Forced In To Machines played March 9, 2019 at the Apollo Bar with Mountain Mansion and The Shallow Void. Check out the live set HERE. IGBC exists in an alternate dimension with no purpose and no design. Listen to the sounds and think it over. The debut album from Forced In To Machines (which is the new breed of IGBC) has been released to the world via bandcamp June 22, 2016. There is no telling what manner of harm it may do but don't let that stop you from taking the trip. Enjoy an old remix IGBC produced of the Purity Control song 'Glitch' back in 2010. Purity Control is no longer in action by you can check out The Shallow Void to see what the man behind Purity Control is up to these days. 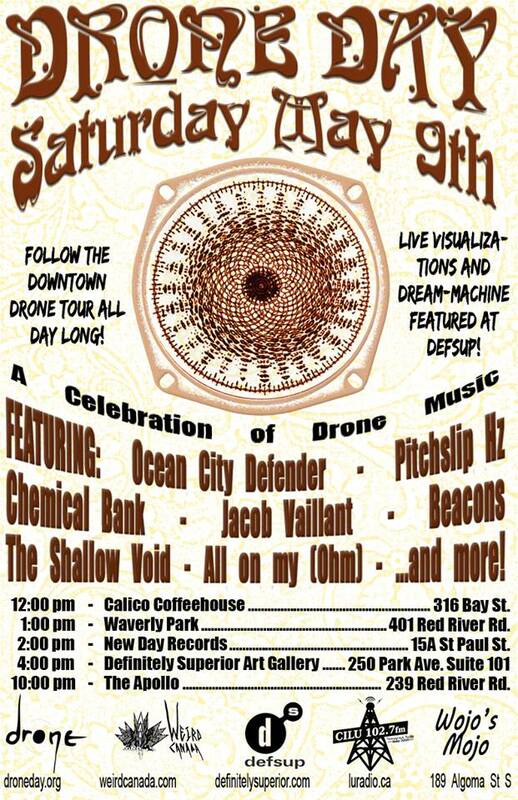 Forced In To Machines will be performing under the pseudonym Pitchslip Hz on Saturday May 28th 2016 at Definitely Superior Art Gallery for Drone Music Day. See the Facebook Event for more information. Forced In To Machines is also putting the final touches on the debut release "Zen for Retail Cubism amid Consumer Culture" via Bandcamp. Forced In To Machines has a new song! Listen to it now. 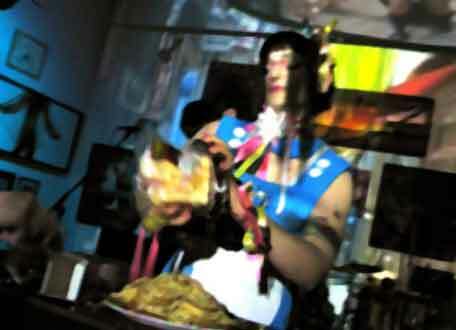 Forced In To Machines debuted Mar 29, 2014 at Definitely Superior Art Gallery with a live, improvised, 2 hour set. It was the opening reception of the annual Urban Infill downtown art extravaganza in Thunder Bay. IGBC lives! Come out March 16th to Definitely Superior Art Gallery for Electronika 4 featuring Thunder Bay's best cutting edge electronic musicians. 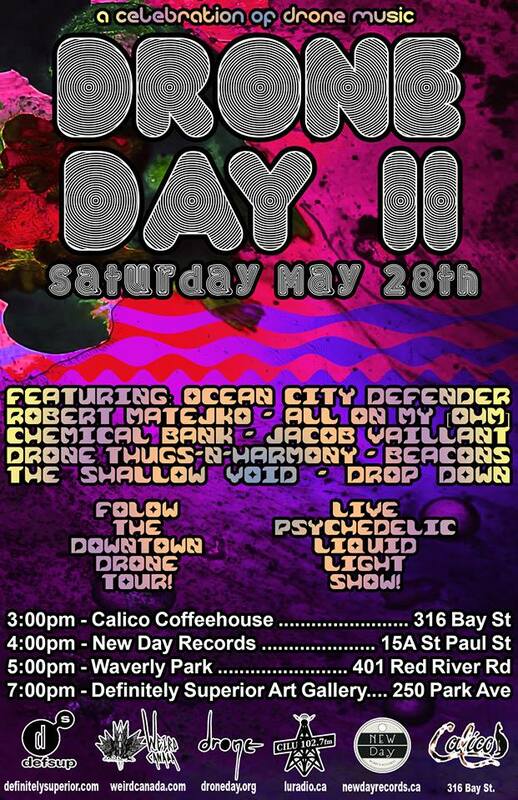 The night will also featuring a guest performance by Winnipegs own Cloudfight. 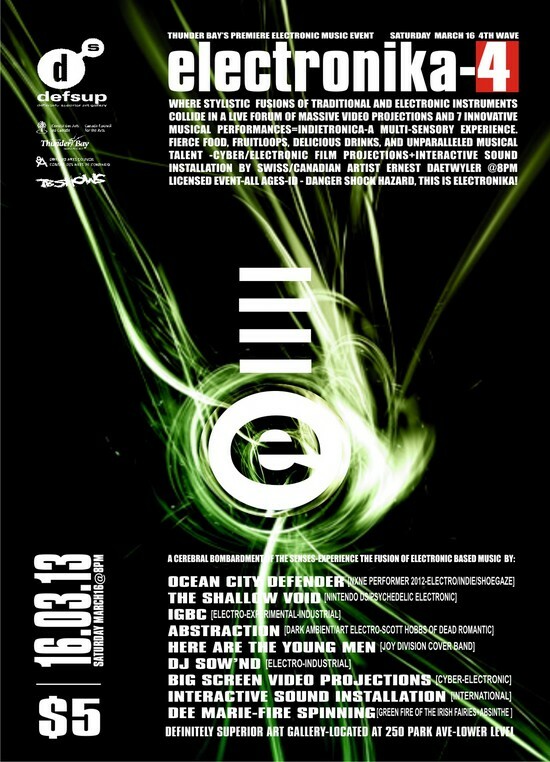 Abstraction, Shallow Void, IGBC, Cloudfight, Ocean City Defender, and Here Are The Young Men covering the songs of the seminal Joy Division, DJ Sow'nd ending the night with a real Electro Party. All the IGBC albums are now on Bandcamp. So stop on by and listen to all the albums for FREE! 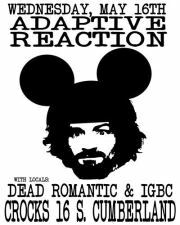 IGBC opened for Adaptive Reaction on May 16,2012 with Dead Romantic. The night was loud and mean with PDW and Orazio in good form. Photos of Adaptive Reaction and Dead Romantic performing are posted at peterdavidwragg.com . 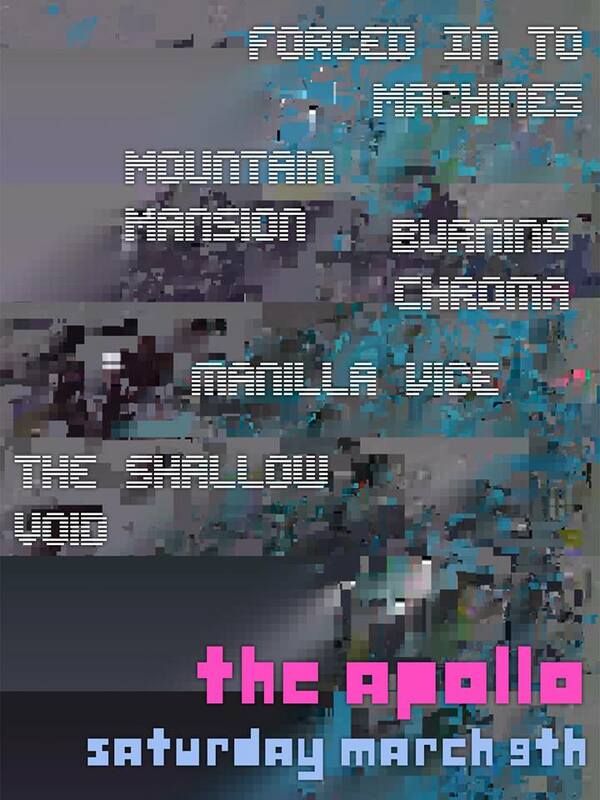 There is also a bootleg of the live IGBC set from that night up on bandcamp. Adaptive Reaction will be playing in town on May 16 at Crocks with new material from their latest EP. Dead Romantic and IGBC will be there to warm up the crowd and support the cause. Come on out and join the festivities on a Wednesday night and get blasted. Join the facebook event and make it official. There will even be IGBC shirts for sale to appease the begging masses who are always pleading for more IGBC merch. On Saturday March 31st IGBC performed at the Definitely Superior Art Gallery Urban Infill Gala opening reception with the 'Dead Space' set live and improvised for 3 brief hours. A recording was made of the performance which may one day be edited to a condensed version for public consumption. IGBC will be performing at the Definitely Superior Art Gallery Urban Infill Gala opening reception on Saturday March 31st as the in-house ambient electro busker from 7-10pm. All live and improv for 3 brief hours. IGBC tore it up and shredded it on Fri, Jan 6th, 2012. It was definitely a night to RAWK URANUS. Norman warmed up the crowd with some great quirk/folk. The Shallow Void (formerly of Purity Control) entranced the crowd with some down-tempo electro industrial beats via a Nintendo DS tuned to space. Ocean City Defender officially released The Golden Hour EP and graced our ears with some retro synth pop. The Reverb Bomb dropped after the IGBC set and it was fast and ferocious. JAFO provided some spectacular visuals VJing the night and DJ LUV made everyone see starw with a rockin' light show. Watch for photos of the night posted on peterdavidwragg.com. A video of Reverb Bomb playing their song "AND GO!" that night is posted on youtube HERE! 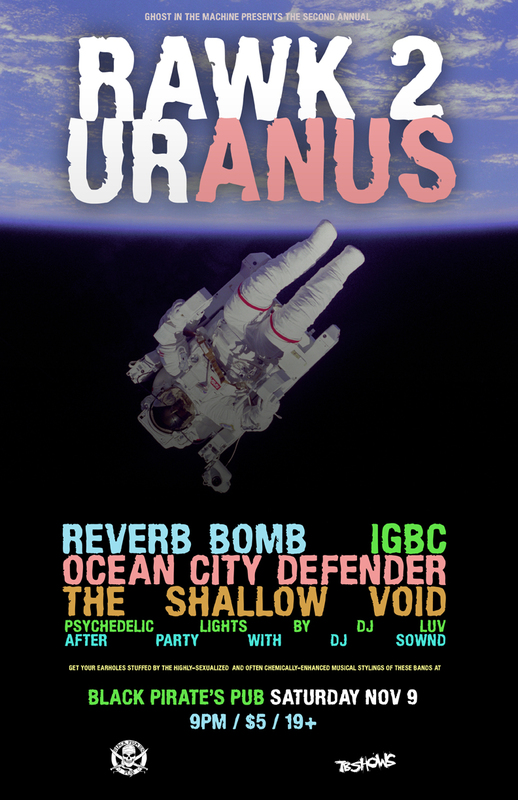 IGBC will be playing January 6, 2012 at the Black Pirates Pub with a host of other great local bands: Unlike 18, The Shallow Void (Otis Haket of Purity Control), Norman (of the Ukeladies), Ocean City Defender, and Reverb Bomb. Lights by DJ LUV and VJ JAFO on the scene makin' it the place to be. The Shallow Void - a DS on tryptophan (no dubstep need apply) (Tryptophan side effects include: agitation; confusion; diarrhea; fever; overactive reflexes; poor coordination; restlessness; shivering; sweating; talking or acting with excitement you cannot control; trembling or shaking; twitching; and sometimes vomiting, dizziness; drowsiness; dry mouth; headache; loss of appetite; and nausea. IGBC - "the new mutant sound of the far north"
This night is sure to induce talking or acting with excitement you cannot control. IGBC played Saturday, October 29-11 for the Definitely Superior Art Gallery fundraiser: The Hunger V.666 for halloween along with 40 other bands. 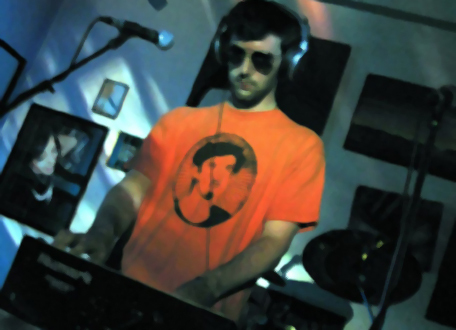 It was a good show with 3 IGBC classics and a live improv jam that drifted into jazz/electro/trance areas. On Monday, September 19-11 IGBC opened for the bombastic Slick Idiot with En Esch & Mona Mur at The Office/Crocks as they kicked off their Canadian tour in Thunder Bay with Ontario's own Promonium Jesters. IGBC blasted the crowd with some monster sounds courtesy of the awesome sound man. Orazio was on fire with his rockin' guitar work as PDW pushed the levels on the mix. Next up Promonium Jesters played fast and furious with Mike Adaptiv of Adaptive Reaction on drums and once Slick Idiot hit the stage all hell broke loose. S.I. played a selection of inspiring tracks driven by Gunter Shulz on guitar and Ethan Mosely of Promonium Jesters on drums. The set was intermixed with songs from the the En Esch/Mona Mur albums along with some new tracks off their latest CD. S.I. ended the night with a great selection of classic KMFDM songs that were co-written by Esch/Shulz such as 'Don't You Blow Your Top', 'Juke Joint Jezebel', 'Go To Hell' and more with an encore of the classic 'Godlike'. Cheers to a memorable show. Photos will be posted on www.peterdavidwragg.com soon. IGBC played Saturday, August 13-11 at The Office/Crocks with Thunder Bay local Ocean City Defender. Our fans came out to enjoy the spectacle and clap enthusiastically. The first 25 people through the door received a limited edition EP featuring 2 songs from each band! They laughed, they cried, they remembered those who had passed before and they were all grateful for our sweet sweet music. Unfortunately some late comers were sad not to receive a free CD due to the overwhelming crowd. Better luck next time you dear patrons of good music. IGBC performed March 26, 2011 for the gala opening of the Definitely Superior Art Gallery Urban Infill exhibition in Thunder Bay. PDW performed a solo show of live and improvised ambient electro for the showing of the 'River' installation by artist Lenka Novakova for 3 hours. The performance took place in a black room dimmly illuminated by a series of conical pillars suspended from the ceiling. Lovely! IGBC played Saturday, March 19th, 2011 at the Definitely Superior Art Gallery for Electronika 3 with Byte-Smasher, The Kettle Black, Purity Control, DJ Doran, and DJ Kelsey. All the bands and DJs were great and there was a good turn-out. During the IGBC set Otis Haket of Purity Control was suspended from the ceiling by a chain connected to 4 hooks through the skin of his upper back. He was slowly raised off the ground and than lowered back down with the suspension taking about 15 minutes. The IGBC show went great with PDW finally upgrading to a laptop and Orazio blasting the crowd with slick guitar work and soulful harmonica playing. 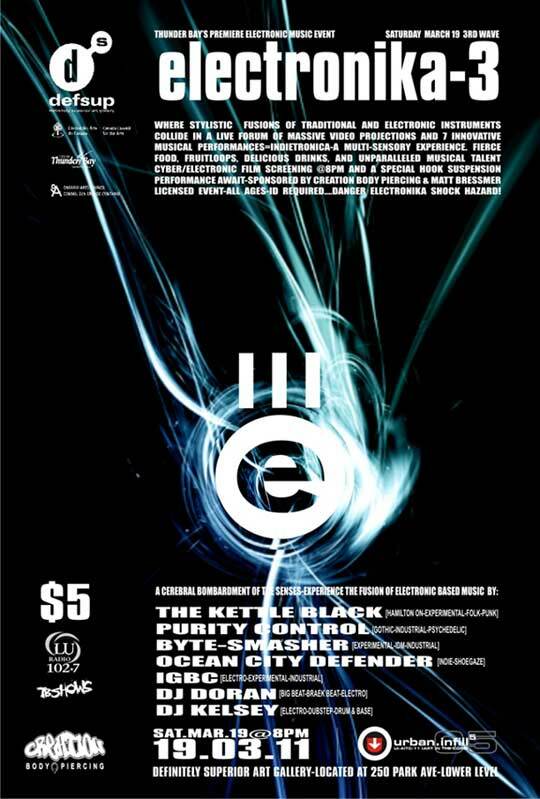 IGBC will be playing March 19, 2011 for Definitely Superior Art Gallery's 3rd Electronika Night featuring: Purity Control, IGBC, Ocean City Defender, The Kettle Black, BYTE-Smasher, DJ Kelsey, and DJ Doran. This will be a great night of local talent and special guest The Kettle Black. Be sure to be check it out. December 12, 2010 - The IGBC website has been redesigned for ease of use and navigation. Check out the new album 'A Simple Sound' with previewed tracks on myspace and CBC radio 3. All songs from the first 2 albums '8 tracks' and '2 swoon' are up for free download. The new IGBC album is now complete and officially released. It is called ' A Simple Sound ' and features 9 pummelling tracks. The first copy was presented to Mona Mur on Nov 17th, 2010 so it will hopefully be heading to Berlin to become the next big thing. To celebrate this milestone 6th album the first two albums ' 8 tracks ' and ' 2 swoon ' are now available for free download. On Nov 17th, 2010 IGBC opened for Slick Idiot with MonaMur/En Esch along with locals Purity Control, Dead Romantic and DJ Kelsey. Due to time constraints there was only time for DJ Kelsey and IGBC to be the openers but Purity Control and Dead Romantic kept the night going with a great aftershow. The IGBC set consisted of some old favourites and an awesome new track off the latest album called 'Hairwip'. Just 3 days before Orazio came up with a monster guitar groove to go with the song. It was a rocker live. Show #10 - IGBC played Oct 30th, 2010 for the Definitely Superior Art Gallery's Hunger Cabaret V.4 for halloween. The event took over 4 bars in the Thunder Bay downtown North core. IGBC played at The Office/Crocks and started out the night with a short and sweet set of 3 rockin' tracks. Orazio joined the fun grinding away on guitar. June 13-2010: IGBC is working on releasing an album of new material within the next year. There are quite a few songs in the works and they will make for a good listen with a bottle of wine by the fire place. Keep your ears open for new tracks previewed here and on myspace. IGBC has remixed the Purity Control song 'Glitch', which can be heard in it's original form on their myspace page. May 10-2010, show # 9 - IGBC played May 7 at Black Pirates Pub, opeing for Edmonton industrial assailants iVardensphere. The festivities started when Purity Control, IGBC, and Chris of iVardensphere made a real racket with a live electroclash jam. Unfortunitely Purity Control were unable to play their set due to a missing keyboard player. IGBC blasted the crowd with a solid set of electro rockers. The first 3 tracks featured the recorded presence of Orazio on guitar. This was another solo effort by PDW. The last 2 songs featured a newly composed booty shaker called 'Master Flash - Newt Hands' and a never before "performed" track off the 'Better Than Real' album: 'Vintage Eternal'. Z3R05YNC dj'd some classic and new industrial beats between sets and iVardensphere labotimised all present with their monster beats and relentless speed. March 3rd, 2010 - IGBC has finally laid down some reworked tracks featuring guitar virtuoso Orazio Armenti sharpening his axe to some classic IGBC tunes. Show number 8 for IGBC took place on July 24, 2009 at Definitely Superior Art Gallery as an opener for Adaptive Reaction's 7" release party. Purity Control performed a solid set of intense music to get the night started. This was the first solo effort for IGBC's PDW. Adaptive Reaction rocked the house as usual. For the lucky patrons who stayed for the late night there was a noize jam with all 3 bands to lull everyone into a dreamy state or reverie. IGBC will eventually be recording some songs that better reflect the live performances with the addition of sampling, guitar, harmonica, and live percussion into the previously released studio material. The reworked material will be released by THE IGBC PROJECT. The 7th IGBC show was on Saturday, February 24, 2009 at Definitely Superior Art Gallery's ELEKTRONIKA KNIGHT with a number of talented local electro musicians. There was also a special performance from Ireland's Paul Haggarty making some 'noize' music. IGBC played a solid set and rawked the joint with the Orazio lighting his guitar on fire. For all those exclaim! @# readers out there turn to the !earshot charts on page 62 of the February 2009 edition. There you will find: Specialty Charts - Electronic Top 10 - #9 - IGBC - Better Than Real. Yes folks, thanks to the support of CILU radio 102.7fm in Thunder Bay, particularly Metal Machine Musik hosted by Myke Guerin of Adaptive Reaction, IGBC has hit the charts. With a little marketing and distribution this may just be the beginning of widespread panic. The sixth IGBC show was on February 7, 2009 at The Black Pirates Pub for a local band showcase. IGBC opened the night for Rock Truck, Silver Medals, The Auditor General, and Makeshift Astronaut. PDW, C.R., and Orazio left the crowd stunned with a jam-packed set of tunes that left little room to catch ones breath. The song ''Martian Planet' off the 'Better Than Real...' album was added to the set list. The audience was mesmerized by the barrage of sound and were quick to offer up comments such as: "Polarizing" , "Fun to watch" , and "I didn't know when to clap". IGBC released the latest and greatest IGBC album November 22, 2008 at their fifth performance in the Definitely Superior Art Gallery. The new album is called 'Better Than Real - White Noise - Drums - Chaos -'. IGBC was part of 'The Good, The Bad, And The Ugly' house party for LU Radio and DefSup. IGBC performed a questionable cover of the Johnny Cash tune 'Ring of Fire'. Orazio warmed up the crowd with a moving harmonica solo in preparation for the sonic assault they were about to experience. C.R. kept the beat and Orazio put the icing on the cake with some rock solid guitar and harmonica work while PDW spun the beats. Thanks to all who showed up... we know who you are. The fourth IGBC performance was on Friday, May 9, 2008 at 'The Apollo' opening for the Promonium Jesters and Adaptive Reaction tour kick-off show, along with Whitey of Chilliwack BC. IGBC ventured into new territory with a special guest collaborator on guitar. Axe virtuoso Orazio played some guitar on three IGBC tunes. PDW kept it all together spinning the tracks and the words with C.R. wielding the digital sticks and tweaking the synth. A big thanks to Orazio for providing the trippin' light show and smoke machine! IGBC played their third show on Saturday, March 1, 2008 at the Definitely Superior Art Gallery 'Elektronica Night' with a variety of other wonderful performers such as Adaptive Reaction, The Kettle Black, Jean Paul DeRoover, and more. The IGBC set was particularly fantastic with Kelly The Bunny grating cheeze and carrots while harassing the lucky patrons. IGBC would like to thank Definitely Superior Art Gallery, their numerous fans, the other performers and all those who were there. IGBC played their second show on Tuesday August 22, 2007 at 'The Office' in Thunder Bay as the opener for Adaptive Reaction of Thunder Bay and the Promonium Jesters from Southern Ontario. It was a fun show with the IGBC set list consisting of six tracks from the upcoming album and live percussion by C.R. who managed the job despite kissing the pavement the day before. 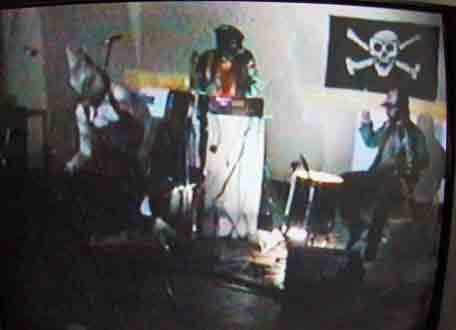 On Monday June 25, 2007 IGBC gave their debut performance at Definitely Superior Art Gallery in Thunder Bay. They were the opening act for the Thunder Bay stop of the Montreal POP OFF tour. The evening started with the two local acts IGBC and Makeshift Astronaut opening for the headliners MONTAG aka Antoine Bedard (from Vancouver/Montreal) and Miracle Fortress (from Montreal). The night also featured a Montreal Band Poster show and sale of posters created by Jack Dylan and Tyler Rauman from Montreal. 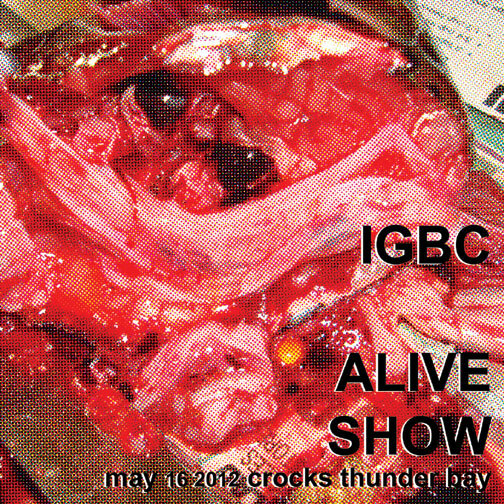 IGBC played a selection of new and unreleased material for the debut show. With PDW operating the tracks and mixing in samples from 'Dr Strangelove' the performance was made all the more exciting with the addition of live percussion courtesy of Chris Roy, formerly of Sueisfine. And if that wasn't enough a large block of marble cheese was shredded over a plate of layered crackers. The cheese shredding and cracker placement was deftly performed by Big Pink Kelly and JAFO. The resulting mound of shredded marble cheese and tasty crackers was completely consumed by the lucky patrons throughout the evening. IGBC extends a heartfelt thank you to all who participated and all who support them.